Made from soft green minky, a flower cotton print fabric and broderie anglaise frill at the front and back of the nappy this green vintage pocket nappy is a really cute choice for your little one. With soft frills in a vintage fabric, this is a pretty cloth nappy without being too over the top or decorated. It will look great under a cute little dress or top, but will still fit fine under clothes when the weather isn’t so good. This medium pocket nappy is to fit approximately 6-12 kg in weight. With a front snap closure, you will get a firm, but comfortable fit. With a double layer of elastic to the back of the nappy and firm leg elastic to help prevent leaks and contain everything within the nappy, the green vintage pocket nappy is a practical is it is pretty. 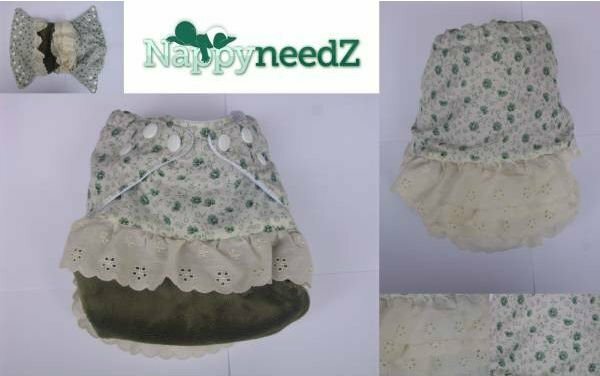 Hand made in New Zealand, this green vintage pocket nappy is a one of a kind design and will not be re-created. With cotton panels to both the front and rear of the nappy, along with the cute broderie anglaise frills, this nappy is inspired by vintage children’s clothing that our grandparents might have worn, but is a modern style cloth nappy. Comes with a hemp and microfibre, tri-fold insert to last a long time between changes. 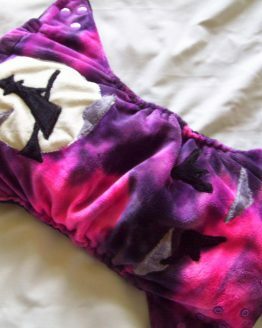 The pocket at the rear of the nappy is a generous size, and easy to stuff, and the nappy is lined with white suede cloth. This white suede cloth layer acts as a stay dry layer, which helps to keep the skin dry, taking moisture away from the skin into the insert.